Exquisite things come in small packages. 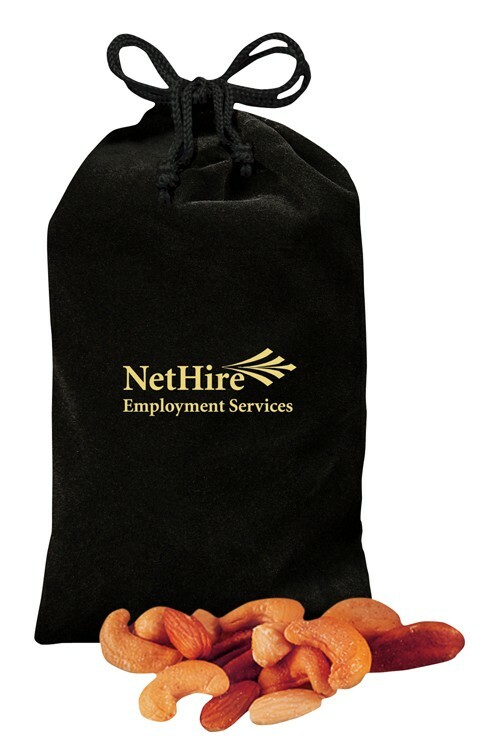 This rich black velour pouch is foil-stamped in gold with your logo and packed with five-ounces of fresh-roasted Deluxe Mixed Nuts. To assure freshness, our products are packed in our traditional air-tight bags within the velour pouch. If individual shipment is requested, individual mailers are available at an extra charge. Food gifts are great for any occasion! Exquisite things come in small packages. This rich blue velour pouch is foil-stamped in gold with your logo and packed with five-ounces of fresh-roasted Deluxe Mixed Nuts. To assure freshness, our products are packed in our traditional air-tight bags within the velour pouch. If individual shipment is requested, individual mailers are available at an extra charge. Food gifts are great for any occasion! • Price includes imprint foil-stamped in gold on bag.